I haven't seen one of these before and boy, is it old ! (Maybe ?). 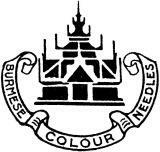 That can't be a date, as fibre (bamboo) needles didn't come in until 1907/1908. These Wade cutters don't seem to turn up often but seem to have been highly regarded back in the day. I haven't experienced one myself but I imagine in good condition they should work very well indeed. Personally I doubt any cutters would work better or more easily than the EMG Davey type though - lots of those seem to turn up and occasionally the price isn't too high. Thank you - very useful information and advice. I make my own bamboo needles and have an HMV cutter - which is okay but not great in my opinion. I will look out for the EMG Davey type in the future then. I like those Wade needle cutters. They do a really nice job if they are sharp and will peel a very small amount off the tip of the needle in the process of sharpening it. The earlier version does not have a "stop" for the needle and can be a bit wasteful if you don't watch what you are doing with them. 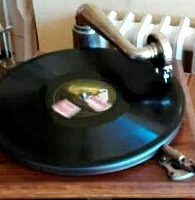 The HMV cutters were designed to be used sitting on the turntable (or on a record), with the base slot over the turntable spindle and with the fibre needle still in the soundbox. They seem to work best that way, but I'm always a bit nervous for fear of damaging something! There are 2 versions of the Wade needle cutter. The one shown is the plain one with just the patent dates. The other one has Columbia markings on it, along with the patent dates.. It has the little notes like you see on the machines and records.